Congress president Rahul Gandhi on Monday met Twitter CEO Jack Dorsey in New Delhi and said the two are fake issues, including fake news. "Twitter has grown into the most dominant 'conversations' platform globally. Jack explained some of the steps being taken to keep those conversations healthy and dangerous to fake news, "Gandhi tweeted. Calling Dorsey a "really interesting and fun guy to meet", Gandhi said they also talked about "all sorts of stuff". "Jack Dorsey the Co-Founder & CEO of Twitter, dropped in for a chat this morning. We talked about all kinds of stuff - from fake news to new emerging technologies; from cryptocurrency to Vipassana! He's a really interesting & fun guy to meet, "he wrote on Instagram. The Twitter CEO later took part in a town hall meeting at the Indian Institute of Technology in Delhi. Dorsey, who is on his first visit to India, reached Delhi on November 10 and had met His Holiness Dalai Lama and travelled to Jaipur before meeting Gandhi. Following his arrival in India, Dorsey said, "My first time here after a lifetime of wanting to experience it." 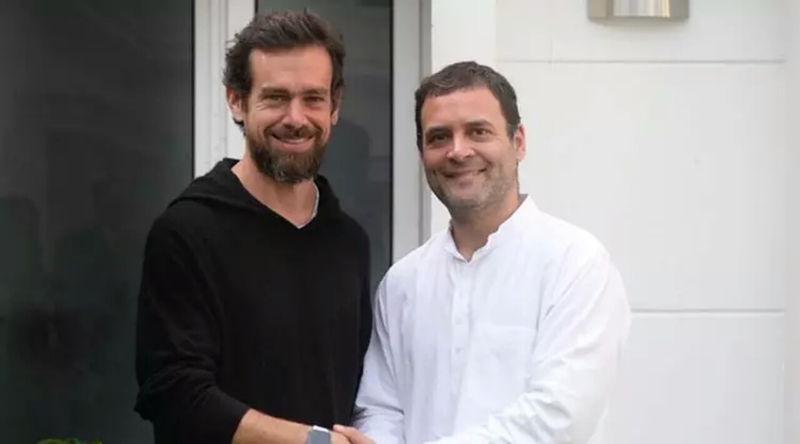 The meeting between Gandhi and Dorsey holds significance as Twitter has become one of the leading social media tools after Facebook and WhatsApp when it comes to spreading fake news.